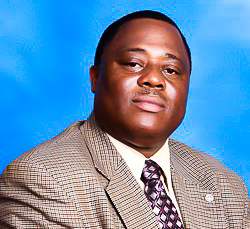 The University of North Carolina Board of Governors has selected 17 outstanding University faculty members to receive the 2019 Awards for Excellence in Teaching, and Elizabeth City State University’s Dr. Kingsley Nwala is one of this year’s honorees. The recipients, who represent all 16 of North Carolina’s public universities and the North Carolina School of Science and Mathematics, were nominated by special committees at each institution and selected by the Board of Governors Committee on Educational Planning, Policies, and Programs. Dr. Nwala is an ECSU tenured professor of economics in the Department of Business and Economics. Prior to joining ECSU in 1997, he taught at Howard University, and worked briefly as an Economic Analyst with the U.S. Congressional Research Services in Capitol Hill. With over 24 years of teaching experience, Dr. Nwala has taught several courses in economics, finance, business, and statistics at ECSU. Dr. Nwala is a very passionate teacher who says he believes that any student who wants to succeed can achieve success through motivation, dedication, hard work and perseverance. He motivates his students, guides and assists them as much as possible, but holds them accountable to deliver. This year marks the 25th anniversary of this prestigious award. Established by the Board in 1993 to highlight the importance of teaching, the award recognizes the extraordinary contributions of faculty members System wide. Dr. Nwala holds a Ph.D. in Economics from Howard University in Washington, D. C. He earned his MBA (Business Administration) and BBA (Finance) degrees from the University of the District of Columbia in Washington, D. C.
According to the Board of Governors Chair, Harry Smith, this recognition of Dr. Nwala and the other recipients is an acknowledgement of their excellence and commitment to his students. “We take great pride in honoring these recipients. They all bring a high standard of excellence in the classroom through creative teaching methods that impact our students,” said UNC Board of Governors Chair Harry Smith. Each of the winners will receive a commemorative bronze medallion and a $12,500 cash prize. Awards will be presented by a Board of Governors member during each institution’s spring graduation ceremony.